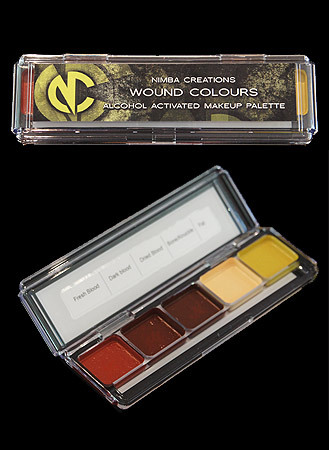 Wound Colours Alcohol Activated Palette is designed by and made exclusively for Nimba Creations, featuring the perfect colours and tones for gore and casualty simulation FX. Tom Lauten has developed an ideal range of colours and combined them into one palette that works brilliantly with gelatine, silicone and foam latex. The palette requires 99% Isopropyl Alcohol (also known as IPA) to active the paints. IPA is widely available at online outlets such as Amazon and can also be found in some local pharmacies. Watch the prosthetic application video below to see this palette in use. 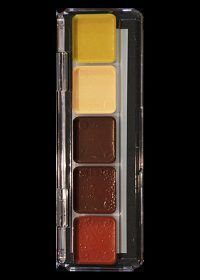 Also see our Perfect Palette 2.0 designed for painting flesh tones and creature prosthetics.